Osteopathy Treatment for Babies after Traumatic Birth in London at Home or at our practices in Belgravia Westminster SW1, Clapham SW4 or Moorgate EC2. Osteopath in London rebalancing baby’s body after delivery. What is Paediatric Osteopathy for Baby’s Traumatic Birth? 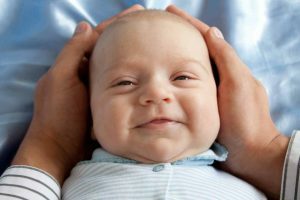 Cranial Osteopathy is a manual and gentle therapy aiming to release any tension on specific areas in order to relax the overall structure of the baby’s body and to realign its imbalance. With this osteopathy treatment for new born babies, you will give your child all the chances to start their life in the best way possible. She is able to see you at your home or at one of our practices in the Light Centre Belgravia (SW1) Westminster, the Light Centre Moorgate (E2) or at our therapy room in Clapham (SW4). In general, it is advised to have at least one osteopathy assessment for your baby after birth. Traumatic Birth can describe any mental and physical traumas that delivery has caused on babies, which can sometimes end up with long-lasting consequences if they are not prevented or treated on time. Most of the time, the injuries affecting babies during childbirth are musculoskeletal related and touch the neck, shoulders and head. Also, when a difficult delivery happens to require the use of medical tools, such as ventouse or forceps, it is common that the baby ends up suffering from plagiocephaly (flat head). In other cases, breech birth and very long or very fast delivery can as well cause injuries and bring imbalance to the baby’s body and mind. What are the signs of Birth Traumas?